Last night I didn't really have a plan for dinner so I sort of pulled something together based on what was in my fridge that needed to be used. 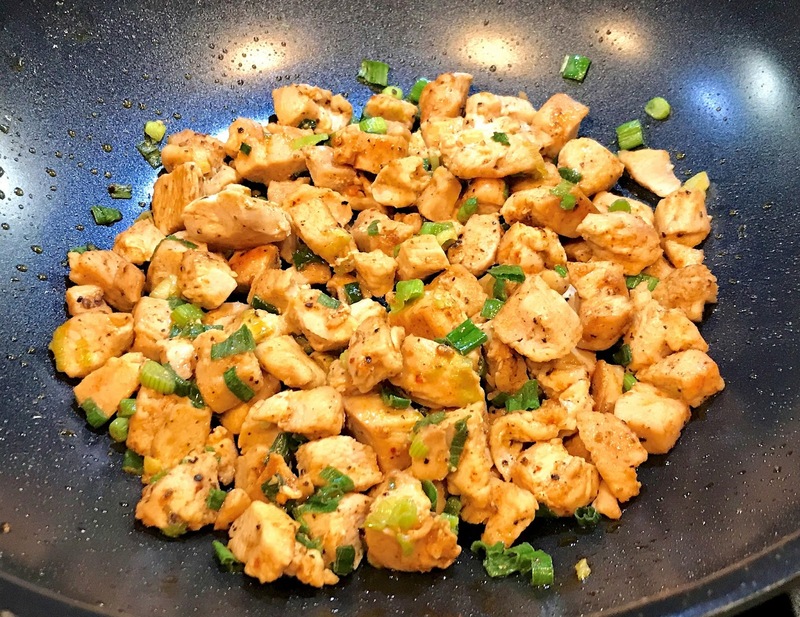 I had a couple packages of Perdue boneless chicken breasts, a bag of Cauliflower Pearls (essentially small diced fresh cauliflower), a small head of fresh broccoli, a bag of carrots, a few green spring onions, and a few very ripe Campari tomatoes sitting on the counter. That became the basis of our meal. I pulled out both of my woks and had them going at the same time to hasten meal prep time. I diced 2 boneless chicken breasts and sliced 3 green spring onions and tossed them into my nonstick wok after heating a bit of olive oil in it over medium-high heat. 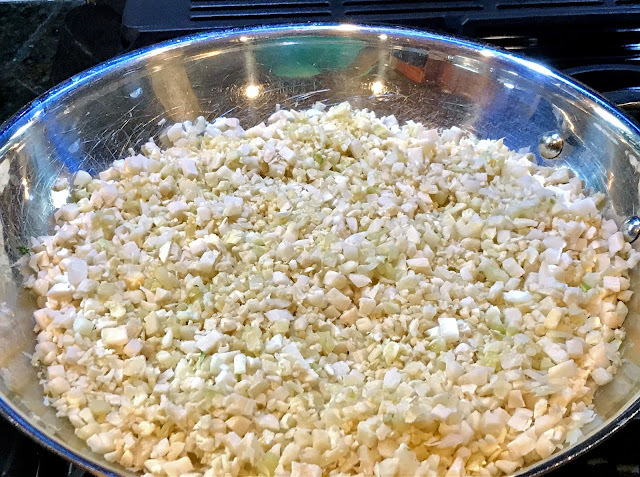 While that was cooking, I cut the broccoli up into florets (about 1-1/2 cups). I diced one medium carrot and then diced 3 small Campari tomatoes. I kept stirring the chicken as it was cooking, and then set it aside when done. 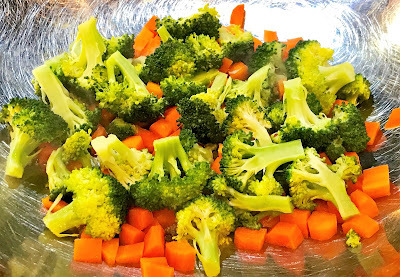 In my regular wok, I placed the broccoli and diced carrot along with about 1/4 cup of water, covered it and steamed the veggies over medium-high heat for a few minutes. I moved the veggies over to a plate and wiped the wok dry and then added a couple of tablespoons of olive oil to it and placed it over medium-high heat. 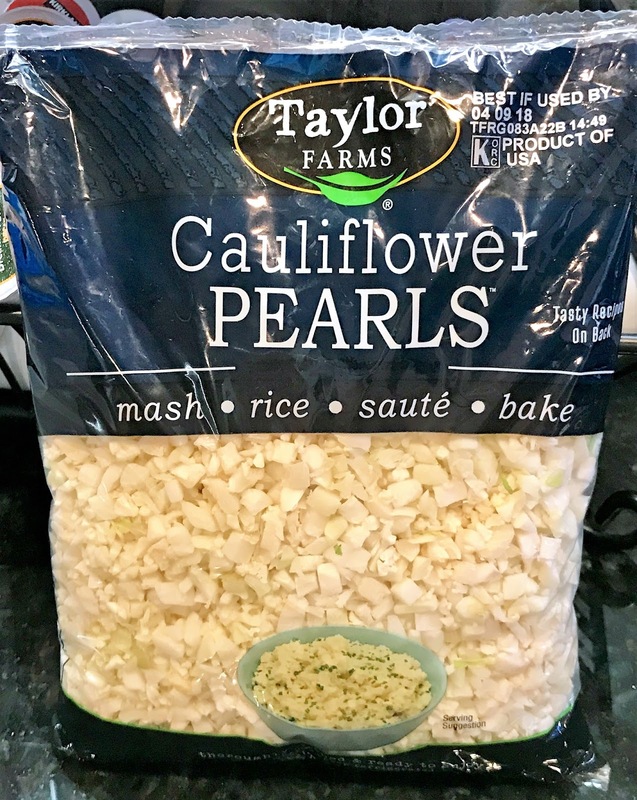 I poured the entire 2-lb bag of Taylor Farms Cauliflower Pearls into the wok, seasoned with salt and covered to cook for about 5 minutes, stirring it a few times. I uncovered the wok and turned the heat up to high while stir-frying the cooked cauliflower pearls to let them dry out a bit. 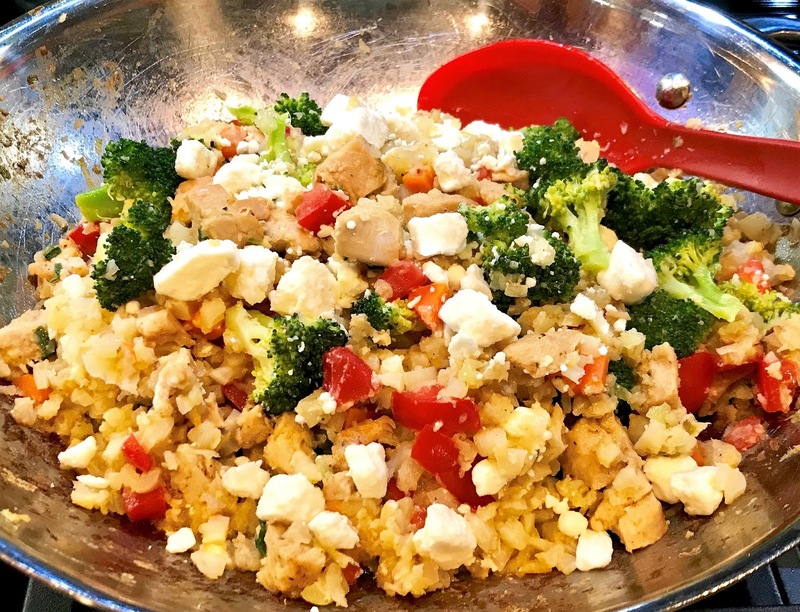 I added the chicken, broccoli and carrots to the cauliflower and tossed in the diced tomato, then seasoned with salt and pepper, to taste. Before serving I added crumbled feta cheese because everything is "betta with feta", right? It just added a nice salty little kick. I topped our meal with a few roasted salted almonds to add a bit of crunch. Even though it seems like a mish-mosh of ingredients...and it was, it was really good! We have plenty left for another meal as well. It was an interesting way to combine a lot of veggies and chicken into a meal that was tasty by using what I had on hand. I snapped a few photos below. Enjoy! We had this recipe for supper tonight. It was delicious and it earned a "thumbs-up" Hubby Approval Rating. I had some left-over deli chicken so I subbed it for the raw chix. I cubed it up and added it at the end just to warm it up. Easy-peasy. Also had some edible pod peas on hand, so I steamed a few along with the broccoli & carrots. I can see myself tweaking this dish a little bit this way or that, according to what's in the fridge. Your version sounds yummy! Is your smaller kitchen in a different house or did you simply pack stuff away to make more room? Great idea using your cast iron skillet too! I need to unpack mine. I’ve got most of my kitchen stuff not used regularly on shelves in my basement. I literally have a “kitchen room” Believe it it not there is still several boxes I didn’t unpack. I haven’t unpacked most of my cookbook collection either. I just can’t part with them yet. I probably won’t move them again but will donate, give away or sell whenever I move again. None of my kids would be interested in them unfortunately. "Spring"? What's that? It's been crazy so far here, too. C-O-L-D! We had a saying in Anchorage ... "It just wouldn't be Easter without snow." Well, we had an Alaska Easter this year! Might warm up to 62 later this week, but it's been all 20s, 30s, and just a tiny bit of 40s all "Spring." I hope the cold weather has "inactivated" all that pollen of yours -- my brother gets that, too, in FL, and I know it can be quite a problem! I wonder if all this cold weather means a hotter than usual summer? That would add insult to injury for sure.